The EPA estimates that less than 10% of mobile phones are getting recycled, and only about 25% of all e-waste (by weight) ends up being collected for recycling. Electronic waste, also known as e-waste, is the discarding of electrical or electronic devices, such as computers, office electronic equipment, entertainment device electronics, mobile phones, television sets, refrigerators etc. 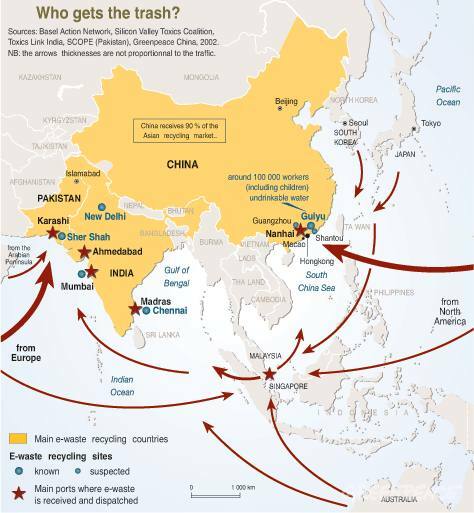 E-waste is a global problem, especially with the transboundary movement of e-waste where developed countries ship their discarded electronic equipment to less developed countries. Upon destination, the e-waste can simply be dumped or dismantled and burned, producing toxic emissions harmful to waste site workers, the environment and nearby communities. E-waste contains a vast array of toxic components including mercury, lead, cadmium, polybrominated flame retardants, barium and lithium and due to this immense toxic diversity, affects nearly every system in the human body. Even the plastic casings of electronics products contain Polyvinyl Chloride (PVC), which can leak dioxin, one of the most toxic chemicals on the planet. E-waste pollution in the air, that workers in e-waste dumps breath in constantly, causes inflammation and stress that leads to heart disease, DNA damage and possibly even cancer. Furthermore, the health effects of these toxins on humans include birth defects, brain, heart, liver, kidney and skeletal system damage and can significantly affect the nervous and reproductive systems of the human body. E-waste currently constitutes 2 - 5% of the U.S. municipal solid waste stream and is rising by 3 - 5% per year. Yet, according to the Global Futures Foundation, e-waste accounts for 70% of the overall toxic waste currently found in landfills. All of these toxins are persistent, bioaccumulative toxins (PBTs) that create environmental and health risks when incinerated, put in landfills or melted down. When e-waste is burned, it creates cancer-producing dioxins which are released into the air we breathe. If e-waste is thrown in a landfill, it's toxins may leach into groundwater affecting local communities. The only safe way to dispose of e-waste is to properly recycle or donate it or try selling or trading it for further use and to keep it's lifespan going! Learn more. Image Source: United Nations Environment Programme. Click to learn more. According to a 2011 study in the journal of the Institute of Physics, Environmental Research Letters, taking apart and discarding cell phones, computers, televisions, and other electronic devices can expose people to contaminants that damage the lungs and possibly contribute to cardiovascular disease and cancer. The researchers said that the study highlights the need to use safer and more environmentally friendly materials in making electronic devices. Cadmium, which is used in soldering, semiconductors and chip resistors, is a known human carcinogen, primarily affecting the lungs following inhalation. Cadmium exposure can also result in the development of hypertension, heart disease, kidney malfunction, and bone toxicity. Repeated exposure can also damage the liver. Learn more. BFR's are well known for their bioaccumulation in human and animal tissue. Chronic exposure interferes with brain and skeletal development, especially in the womb. Endocrine disruptor can cause delayed puberty and metabolic abnormalities. *Most of the information in this section originates from these two sources. 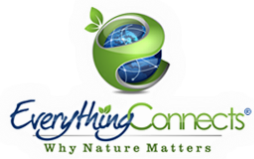 battery contacts, is a Category 1 carcinogen, which is carcinogenic to both animals and humans. Exposure to beryllium is known to damage skin, and if inhaled, can cause serious damage to the lungs. Extreme exposure can lead to a potentially fatal condition known as Acute Beryllium Disease. Learn more. Antimony, is used in the production of diodes, batteries and semiconductors, and is toxic to humans in ways similar to arsenic. Chronic exposure to antimony in the air may exacerbate irritation of the eyes, skin, and lungs. Long-term inhalation of antimony can potentiate pneumoconiosis, altered electrocardiograms, stomach pain, diarrhea, vomiting, and stomach ulcers. Antimony is fatal in large doses. Lead, which is used primarily in the soldering of circuit boards and other device components, is highly toxic, affects virtually every system in the body and is particularly harmful to the developing brain and nervous system of fetuses and young children. Lead is extremely harmful to the human body, damaging both the central and peripheral nervous systems, potentially causing seizures, retardation, high blood pressure, damage to the kidneys and liver and adversely affects child development. Learn more. Phthalates are a group of hormone-mimicking compounds widely used in consumer products and a known endocrine disrupter and reproductive toxin. There is a strong link between exposure to phthalates and allergies and asthma in children. Learn more. Mercury, which can be found to a degree in batteries and circuit boards, is a potent-neurotoxin. Mercury damages the lungs, liver and kidneys. Chronic exposure can lead to emotional instability, sleeplessness, muscle weakness, headaches and damage to the digestive system. Mercury attacks the central nervous and endocrine systems, is harmful to the mouth, teeth and gums and poses risks in the neurological development of unborn fetuses. and semiconductors, is a notoriously potent poison, which can cause severe damage to the digestive tract. Long-term exposure to arsenic in drinking water can cause cancer in the skin, lungs, bladder and kidney. It can also cause other skin changes such as thickening and pigmentation. Chromium Haxavalent is a known human carcinogen, which is highly toxic even at low concentrations. Exposure can result in damage to skin and lung tissue, as well as to the liver and kidneys. PVC is among the most toxic plastic on the planet. When incinerated or burned, it releases highly toxic chemical compounds. Besides acting as a carcinogen in humans as well as animals, PVC may disrupt multiple growth factors, and developmental processes, cause pulmonary dysfunctions and may be toxic to the developing immune system in humans and animals. Many dangerous chemical additives and heavy metals can be released from the material over its lifetime and after disposal. Learn more. "We have serious concerns about unsafe handling of used electronics and e-waste, in developing countries, that results in harm to human health and the environment. For example, there are problems with open-air burning and acid baths being used to recover valuable materials from electronic components, which expose workers to harmful substances. There are also problems with toxic materials leaching into the environment. These practices can expose workers to high levels of contaminants such as lead, mercury, cadmium and arsenic, which can lead to irreversible health effects, including cancers, miscarriages, neurological damage and diminished IQs. EPA estimates that, in 2009, US consumers and businesses discarded televisions, computers, cell phones and hard copy peripherals (including printers, scanners, faxes) totaling 2.37 million tons. Approximately 25 percent of these electronics were collected for recycling, with the remainder disposed of primarily in landfills, where the precious metals cannot be recovered." Manufacturers are major contributors of e-waste, which consists of defective IC chips, motherboards, CRTs and other peripheral items produced during the production process. It also includes defective PCs under guarantee procured from consumers as replacement items. Learn more. Consumers who dispose of their old appliances or other electronics. 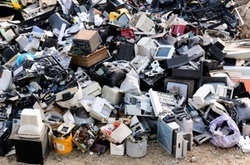 Currently, most discarded consumer elctronics end up in landfills. Imports of e-waste are legally prohibited, such as in India. Nevertheless, e-waste is illegally imported due to loopholes. Learn more. Infographic by Wellhome.com. Click to enlarge.